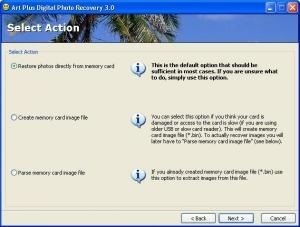 Free Digital Photo Recovery Software Art Plus Digital Photo Recovery software can help you recover lost images from corrupted or accidentally formatted digital camera memory cards. This Free Digital Photo Recovery Software should be able to read all memory cards currently available on the market and recover lost JPG, TIF and most of popular RAW file formats. While it's not optimized for that task, Art Plus Digital Photo Recovery software can actually also read damaged floppys, CDs and DVDs.